Here is what some of our clients are saying about working with Grand River Granite. "Working with Grand River Granite was great! They worked well with the constantly shifting schedules of contractors and kept our house building project on time and on budget. The kitchen countertops have been a source of many compliments from our friends and family." 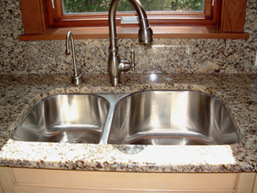 "The installation of our kitchen and bathroom countertops were done in a very professional manner. We are very pleased with the results. "